The Preakness is held every third Saturday of May at the Pimlico Race Track. Like all of the Triple Crown Races, it has it's own signature cocktail and that is the Black Eyed Susan, traditionally a vodka and citrus drink. From the original vodka, rum, triple sec, orange and pineapple juice version, the Susan has been served up as recipes that added peach schnapps or a shot of bourbon and even a splash of Elderflower liqueur. It all seems to depend on the bartender or which booze is sponsoring the race each year. Orange juice is a constant, while pineapple juice slips in every once in awhile. Even grapefruit juice was added at one time. The current official recipe calls for 1-1/2 ounces of Effen Vodka, 1 ounce of Maker's Mark Bourbon, with 2 ounces of orange juice, and 2 ounces of (ugh!) sour mix, garnished with a cocktail cherry and an orange slice. Two guesses who the alcohol sponsors are this year. I don't like bourbon and vodka together and you all know what I think of sour mix. I've done my own cocktail versions for the Kentucky Derby as well as the above mentioned Belmont Stakes and, since no one seems to be able to make up their mind on the Black Eyed Susan, I figured I was well within my rights to toss my own recipe into the race! Originally the cocktail started out with vodka and rum, then dropped the rum when vodka was having it's heyday at the turn of the millennium, then whiskey snuck in and sort of stuck along with the whiskey sponsor. Despite tradition, I'm just not into the vodka for this one. With the fruit juices I really want some alcohol with some muscle and a little age on it, so I'm going with rye and rum, both of which play very well with the pineapple and the orange. I also added a dash of bitters to cut the sweetness I've included with the coconut honey. DIRECTIONS: Add the hot water to the Honey Cremé Coconut to create a syrup and allow to cool. Gently pack the Collins glass with crushed ice high enough to create a mound. 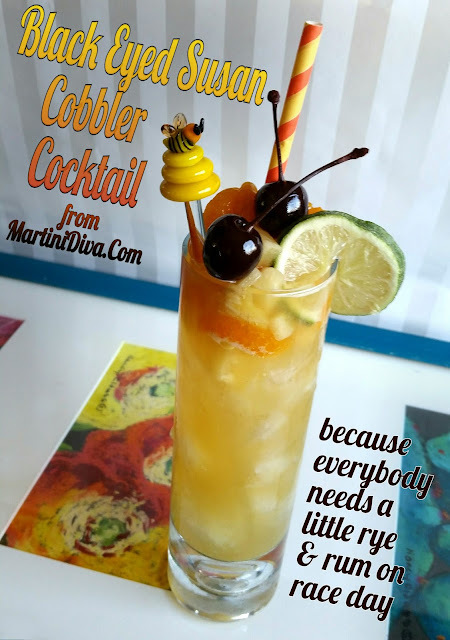 Pour the rye, rum, pineapple, orange and lime juices, then the cooled coconut honey syrup into a cocktail shaker filled with ice and shake until chilled. Strain into the ice filled glass. 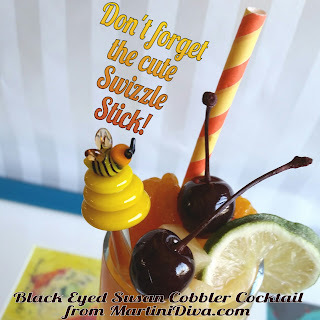 Pile on the fruit, tap on the bitters, lay on the edible flower if you have one, add a fun swizzle stick and a straw and serve. If you prefer to go with a more traditional horse race cocktail, here are a few of my variations on the Mint Julep.